Well, I’ve read Dickens’ A Christmas Carol. I’ve watched Michael Caine being nasty Scrooge and nice Scrooge on a Sky Christmas movies’ loop; and sung along with assorted Victorian muppets (including horses, raccoons, and lobsters – who knew Victorian society was so diverse) all seated around a Christmas table, as they god blessed us everyone. I’ve sung 6 Christmas carols during my community choir’s Christmas concert (choir post here) while the words flashed by on a large screen, behind and above me on the raised stage, so the audience could join in; and watched as the look on my conductor’s face went from studied concentration to amused confusion. Learning later that, whoever had typed the words to the most famous carols in existence, and then loaded them on to that screen, had made quite a few stupendous spelling mistakes, causing audience members to roll around in the aisles. I’ve listened to a kiddies choir, practising for their Christmas concert – belting out I’m Walking in the Air, the most Christmassy Christmas song out there and am due to go carol singing around the local streets this Friday evening. I’ve walked round Sainsbury’s, feasting visually on their new Christmas line, featuring cute robins on cups, plates, candles and cushions; and eyed up the chocolate reindeer and the Cadbury selection boxes. 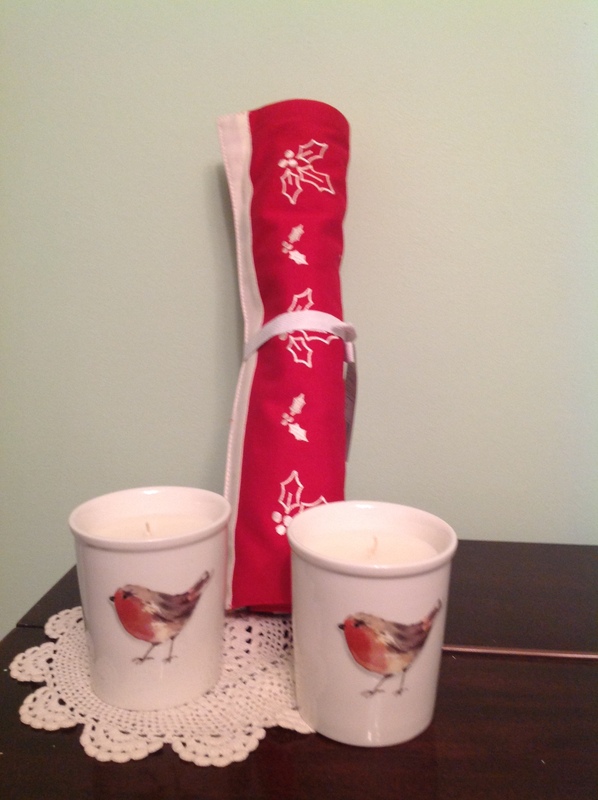 I even splashed out on two robin candles and something called a table runner (I know how to waste hubby’s money at Christmas) for when the sons are home for Christmas dinner. But to no avail. I just don’t feel Christmassy – not yet – but everyone else is definitely feeling the festive buzz, judging by my row of four terraced houses. 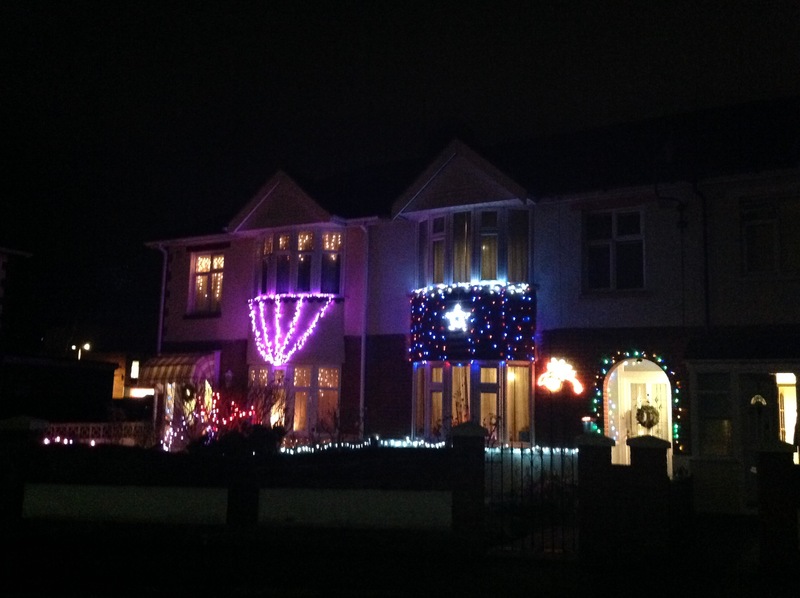 Three of the four houses are adorned in festive brilliance, whilst yours truly’s humble abode remains in cheerless darkness. This has caused a couple of friends to chastise me for ‘letting the side down’, for making the house look like it’s unlived in; that it’s a sad, pathetic excuse of a house, when all around it electric lights are hanging from UPVC eaves, and windows are all aglow. Below is neighbour one, who has yet to hang gigantic icicles around his roof (this is happening he promises, as if the tree sticking out from the wall isn’t more than fulfilling his Christmas decs duty !) – and here he is, showing up my dismal and dark hovel. This is a scenario played out every year, because my long standing neighbours can’t wait to jump the Christmas gun – it’s almost like the month of December is their raison d’etre; whereas I sit there thinking morosely: ‘it can’t be time to get the tree out again surely? It feels like I just put it all away!’ Leading to pessimistic thoughts on the speedy nature of time, rather than the requisite Yuletide jollity. Come every December 1st neighbour one gets his lights up in a twinkling (see what I did there) the other two rapidly following suit. 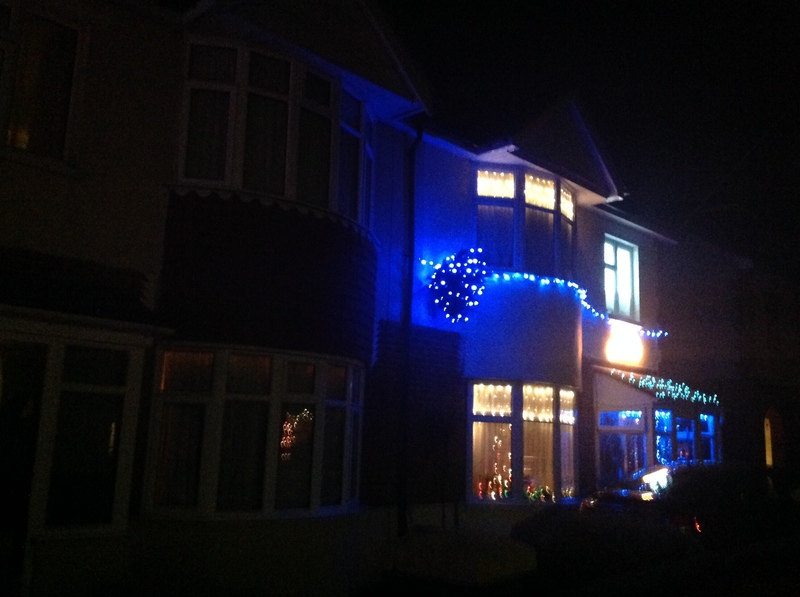 But this year neighbour two had his lights up by November 29th (a new record, due to the fact that he now has two tiny grandchildren, so is full of decoration-based glee) causing neighbour three to rapidly bung his up the very next day, not to be outdone in the festive lights wars. My current lack of festive spirit is a far cry from when sons 1, 2 and 3 were young. Back then I only had to watch the ’Holidays are coming……Holidays are coming…..’ Coca Cola truck advert to be transported straight to the North Pole. We’d take the kids to Marwell Zoo every December, riding the Zoo train up to the old house, and line up for hours in the freezing cold, winding our way through the magical grotto before meeting Santa. A meeting which never failed to make at least one son burst into terrified tears. It’s my confirmed belief that the adults get far more out of the Santa experience than the kids ever do; particularly when you got to the bit where they dished out free mince pies and gallons of mulled wine. Now that the Santa visits are firmly in the past, I realised that the run-up to Christmas just isn’t that christmassy anymore; because my once little kids are now much bigger kids. 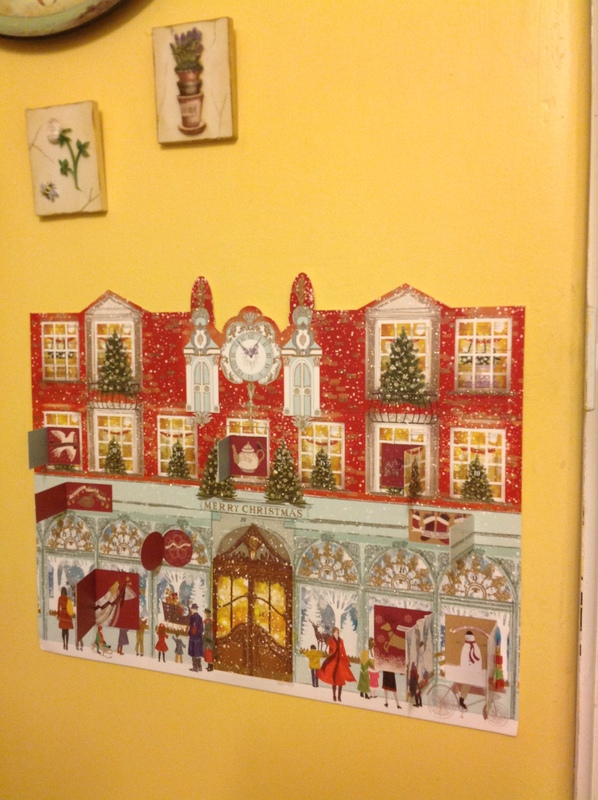 Determined to do something about this non-festive state of affairs, I got myself an Advent calendar four days ago. Not the chunky, chocolate variety ones I always got the sons – because the sons are all away; so I got myself the sort of Advent calendar I actually like, rather than one featuring Darth Vader. Yes, my local Co-op had a box full of completely black Advent calendars promoting the Dark Side – which, even if you’re an Atheist, kind of goes against the fuzzy, warm, peace to all mankind point of Yuletide. In a further attempt to instill the Christmas spirit I’ve been singing along to the best Christmas pop song ever written – bar none – this might be beginning to work, even if Greg Lake’s message isn’t exactly upbeat, but still highly relevant.